"Our Grandson, Charlie, absolutely LOVES the Pickle Bumps book! What a fun book to read to him. He tells us all the time....Bob Fulton wrote this book and has to go to the back of the book to look at his picture with his grandchildren. Then we always have to read to him what Bob wrote in his book. I think it may turn out to be his favorite of all time." "Fulton rather ingeniously creates a variety of characters - olives and pickles - who have names certain to elicit laughter from young children. There's Gert and Mertin Gherkin, Olive Pitt and Karl Kalamata. It's funny and replete with tongue twisters to challenge kids to start their enjoyment of reading early - with a timely, positive message of acceptance of those who are different among us. So Pickle Bumps for Baby Dill gets my best recommendation for those looking for an entertaining, yet instructive story for children. It's designed to be read out loud and encourages adult-children interaction." "Fulton delivers a strong message via the Dill family and Baby Dill's friends. His book offers encouragement. "We like you just the way you are," Baby Dill's friends tell him. That's a message that needs to reverberate throughout our schools, our homes, our communities." "Thank you for the copy of Pickle Bumps for Baby Dill. It is adorable! A fun story to read out loud (even for adults to adults, as I can attest!). The text is fun and the art work is unique and delightful. A great concept!" 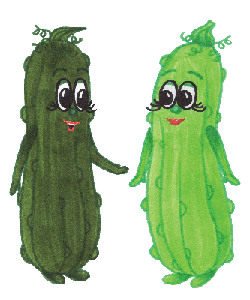 "Boyceville, home of the "Picklefest" celebration loves Pickle Bumps for Baby Dill! It is always the first book picked from our shelf for silent reading time. The message in this book helped my students embrace their differences and their individuality. The unique illustrations draw the reader in and the clever characters and dialogue keep them entertained and wanting more." "Pickle Bumps for Baby Dill is a delightful story with sounds to twist the reader’s tongue and a solid lesson for listeners. I read this story to my kindergarteners and heard ‘Can we read it again?’ Pickles have never been so cute!" "Bob Fulton's Pickle Bumps for Baby Dill is a bright, colorful story of a young pickle's journey to self-acceptance. This book is full of original ideas, tongue twisters, and fun for all ages. I highly recommend it!" "Pickle Bumps for Baby Dill mixes a healthy dose of humor with a meaningful message. It is perfect for teaching young children the importance of celebrating differences." John Martin, President, Bellwether Media, Inc.